LMU is looking forward to welcoming new international students. Many of you will be registering at LMU as students of study abroad programs such as Erasmus, LMUexchange and DAAD etc. In order to help you to get off to a good start at LMU and in Munich we are organizing a language preparation and orientation program during the month of September. Here you are able to download the overview of the offered programs for September 2019. If you already have a good command of German and do not wish to take a language course you can just participate in the excursions. We encourage you to take advantage of this program as you can improve your language skills, make new acquaintances and get to know LMU in a casual atmosphere. 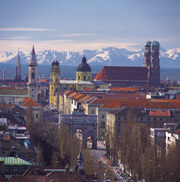 This new study preparation program is hosted by the International Office of LMU Munich.